For other uses, see Shooter's Hill (disambiguation). Shooter's Hill (or Shooters Hill) is a district in South East London within the Royal Borough of Greenwich. 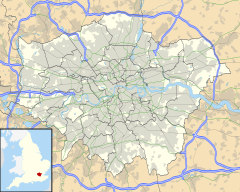 It borders the London Borough of Bexley. It lies north of Eltham and south of Woolwich. With a height of 132 metres (433 ft), it is the highest point in the Borough of Greenwich and one of the highest points in London. Shooter's Hill also gives its name to the A road which passes through east to west and is part of the A207 road, the A2 road, and also Watling Street. It reputedly takes its name from the practice of archery there during the Middle Ages, although the name is also commonly linked to its reputation as a haunt for highwaymen and was infamous for its gibbets of executed felons, mentioned by Samuel Pepys in his diary in 1661. The name is also linked to the Second World War, where it was the site of an array of anti-aircraft guns which protected London. As part of 'London Stop Line Central' it was a last line of defence from a German land invasion, that was assumed would follow Watling Street from Dover. A number of devices were under the control of the Home Guard including a fougasse and a flame thrower. Adjacent to an anti-aircraft battery was built a prisoner-of-war camp on what is today part of a golf course on the north-eastern slopes. Eltham Common was the site of Shooter's Hill police station (now closed). Eltham was allegedly the only town in England with two fully functional police stations (the other in Well Hall Road), having been placed there due to the lawlessness associated with that area. "Shuttershill, on top of which hill you see a vast prospect ...some lands clothed with trees, others with grass and flowers, gardens, orchards, with all sorts of herbage and tillage, with severall little towns all by the river, Erith, Leigh, Woolwich etc., quite up to London, Greenwich, Deptford, Black Wall, the Thames twisting and turning it self up and down bearing severall vessells and men of warre on it". As the name also implies, the district is centred upon a hill - one of the highest points in London 132 metres (433 ft)  - offering good views over the River Thames to the north, with central London clearly visible to the west. Oxleas Wood remains a public open space close to the top of the hill; there is also a golf-course and one of the last remaining areas of farmland in inner London, Woodlands Farm (now an educational charity). Shooter's Hill Road stretches eastwards from the heath at Blackheath up and over the hill, initially as part of the A2 road as far as the Sun in the Sands, and then the A207. The road follows the route of Watling Street, a Roman Road linking London with Roman settlements in north Kent. This was used as a route for horse-drawn mail-coaches linking London with Dover. Byron's Don Juan is waylaid while romantically musing on Shooter's Hill when he first arrives in London (Canto XI). As the narrative of Charles Dickens's A Tale of Two Cities opens, Mr. Jarvis Lorry is a passenger in the Dover mail coach, "lumbering up Shooter's Hill"; and Dickens refers to a public house there in The Pickwick Papers. The name Shooter's Hill is also mentioned in Bram Stoker's Dracula although referring to the Hampstead area, some distance away, and also in H.G. Wells' The War of the Worlds and by Thomas Carlyle. On 11 April 1661, diarist Samuel Pepys mentions passing under "the man that hangs upon Shooters Hill" (probably a highwayman hanged and left to rot as a warning to other criminals - at 'Gibbet Field', now part of the local golf-course). In the graphic novel V for Vendetta by Alan Moore and David Lloyd, the character Evey Hammond describes her childhood, spent on Shooter's Hill. The distinctive gothic revival water tower at the top of Shooter's Hill is a landmark that was built in 1910 and can be seen from far around. Other local landmarks include Severndroog Castle, a folly designed by the architect Richard Jupp in 1784 and built to commemorate Commodore Sir William James, who on 2 April 1755 attacked and destroyed a pirate fortress at Suvarnadurg along the western coast of India. Another water tower (of 130 ft) is further west down Shooter's Hill. This was originally built in the 1890s to designs by Thomas W. Aldwinckle to supply water to the 'Brook Fever hospital', which was demolished in the 1990s, to be replaced by a housing development. The tower consists of a plain brick pillar ornamented simply with bands of terracotta tiles and windows like arrowslits. It is not listed, but it was cleaned, repointed and underpinned for conversion into a family home. It is the centrepiece of the housing estate. Immediately to the east of the housing estate is the Grade II listed former Royal Herbert Hospital, today the Royal Herbert Pavilions. Further up the hill is the still-functioning Memorial Hospital. In 1749, 'The Bull' public house opened just west of the summit of the hill, and was used as a refreshment stop by the coaches, although not by the Royal Mail, which had an interchange of mail bags at the Post Office by the Red Lion on the London side of the hill. An 18th-century grade II listed milestone in the grounds of Christ Church on Shooter's Hill has 19th-century plates giving the distances "Dartford 7 miles", "London Bridge 8 miles" and a later addition: "130 miles to Ypres: in defending the salient our casualties were 90,000 killed, 70,500 missing, 450,000 wounded", commemorating the Battle of Ypres. During the 1950s alterations were made to the road surface to make the incline less steep. Low-powered motor vehicles of the era frequently struggled to get to the top. As a remedy, a small section of the road surface west of the summit was excavated and removed to slightly decrease the gradient. This alteration is evident today where the road surface (opposite Craigholm) runs through a cutting and the pavement (following the original gradient of the hill) can be seen to rise about 1–2 metres above the present-day road surface. TV cook Fanny Cradock and her husband Johnnie Cradock lived in Shooter's Hill Road. Noted comics writer, Steve Moore spent his entire life living in the same house he was born in on Shooter's Hill. His life, area and its history were dramatised by Alan Moore's essay Unearthed in an anthology of essays on London edited by Iain Sinclair. Unearthed was later turned into a dramatic reading. English engineer Samuel Brown developed an internal combustion engine that used hydrogen as a fuel and tested it to propel a vehicle (arguably one of the earliest automobiles) up Shooter's Hill in 1826. English musician, songwriter, guitarist Steve Peregrin Took (T.Rex, Shagrat, Steve Took's Horns) was educated at Shooter's Hill Grammar School on Red Lion Lane (formerly the Woolwich County School). English actor, comedian, satirist, Frankie Howerd was "gently educated at Shooter's Hill" Grammar School, as he recalled his time there. Shooter's Hill is served by many Transport for London bus services connecting it with areas including Woolwich, Eltham, Greenwich, Bexleyheath, Thamesmead, Lewisham and Crystal Palace. The closest rail links to the area are Welling and Falconwood railway stations. ^ "Greenwich Ward population 2011". Neighbourhood Statistics. Office for National Statistics. Retrieved 14 October 2016. ^ "Shooters Hill Local History Group – Prisoners of War and the Local Community". e-Shooters Hill. Retrieved 17 May 2017. ^ "History". Shooters Hill Golf Club. Retrieved 17 May 2017. ^ Partridge, Chris (25 July 2004). "Tall order to save romantic tower". Guardian. ^ Historic England. "Milestone to North of Christ Church (1211875)". National Heritage List for England. Retrieved 25 November 2015. ^ "Ypres Memorial Milestone". Public Monuments & Sculpture Association. Archived from the original on 26 November 2015. Retrieved 25 November 2015. Shooter's Hill in Views in Suffolk, Norfolk, and Northamptonshire (1818). Wikimedia Commons has media related to Shooter's Hill.